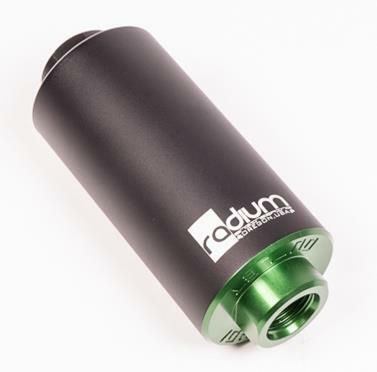 The Radium Engineering high flow fuel filter has a 3 piece body that is CNC machined from 6061 aluminum and Type-II anodized for maximum corrosion resistance. Both removable end caps feature large -10AN ORB female threaded ports for high flow plumbing. The fuel filter comes preassembled with Viton O-ring seals for all fuel types including gasoline, diesel, methanol, ethanol, and alcohol blends such as E85. High fuel pressures < 150psi can safely be used with negligible pressure drop. The filter features a large 4.2”x1.75” element maximizing flow without sacrificing filtration. The filter design allows for flexibility when selecting element material. Because of this, the filter can be use in any part of the fuel system. Please select the element that matches the specific application. With engine power levels globally increasing, pump heat is fast becoming an issue in fuel systems. This custom extrusion includes cooling fins that help dissipate heat. The conductive 6063 aluminum design directly clamps to the fuel filter body with 2 countersink stainless steel screws. For maximum efficiency, this unit must be mounted in a location where cool air can pass through the cooling fins, such as underneath the vehicle. Four M6×1mm stainless steel screws are included for mounting to the chassis. The unit is bright-dip anodized black with a laser engraved design. This 6061 billet aluminum clamp is designed specifically for 2 filters (or 1 filter and 1 Bosch 044 pump). A stainless steel M8 bolt and lock nut is included. This clamp must be mounted to a flat surface. The clamps are bright-dip anodized Radium green with laser engraved logos. This 6061 billet aluminum 2-piece clamp consists of two halves that grip the filter body. Three stainless steel M5 bolts are used to mount the clamp to the vehicle and two additional screws are used to secure the clamp halves together. The clamp is bright-dip anodized black with a CNC engraved logo.